I first did this hike because Mike Coltrin's Sandia Mountain Hiking Guide describes it as "an ideal hike for the winter months.” Most of the route is south-facing and the whole thing is below 7200 feet, so snow melts off quickly. Also, the ground consists of decomposed granite so when the ground is wet, there's very little mud. The biggest problem during that first hike was the cold breeze on the exposed upper part of the trail. Access is no problem; the hike starts where Copper Avenue stops, at the east end of Albuquerque, at 35 deg. 4.751 min. N, 106 deg. 29.072 min. W. At the parking area, three trails head toward the mountains. Take the rightmost of those three options, or ESE at first. That trail soon bends to the right. As you reach trail junctions, choose a trail that takes you toward and then up the obvious saddle to the south. The top of the saddle is at 35 deg. 4.295 min. N, 106 deg. 28.939 min. W. Once there, choose the path that takes you uphill and east, past a set of power poles. Continue to the east and uphill, paying attention to the trail to avoid being diverted onto dead-end side paths. In particular, as you approach 35 deg. 4.272 min. N, 106 deg. 28.640 min. W you’ll be tempted to continue at the same approximate elevation, across a small hanging valley and toward a saddle. However, at that waypoint the correct path bends left and threads its way uphill, to the top of the ridge to the north. You’re on the correct path if at the top of the ridge you find yourself squeezing past a couple of boulders. At the top of a ridge, the path squeezes between two boulders. The trail then heads southeast and uphill, to the saddle at 35 deg. 4.314 min. N, 106 deg. 28.470 min. W. There the trail turns left (north) to follow the local ridgeline. As you proceed, the path will bend to the ESE. At 35 deg. 4.367 min. N, 106 deg. 28.166 min. W, the path bends northeast and upward. This part of the trail may seem dauntingly steep, but you'll soon be there. The Eye of the Sandias is at 35 deg. 4.574 min. N, 106 deg. 27.989 min. W.
The Eye is barely visible in this photo, under the boulder perched on a granite outcrop (right of center). According to Coltrin, "The Eye appeared sometime in the 1960s." That's far enough in the past to make the Eye a historical pictograph, so hopefully the Forest Service will let it be. If you wish to extend the hike, the trail wanders past that point, on up the ridge. Even if you don't use hiking poles on the way up, you may be glad to have them on the trip back down. The decomposed granite in the western Sandias acts a lot like ball bearings on steep downgrades, and if you're at all wobbly the poles will help you stay on your feet. The poles will be especially welcome if you take Coltrin's suggested alternate route back to the parking area (from his EYEWP4 to his EYEWP5), as that route is steeper and more uncouth than the main route. As a further thought, the alternate route often follows north-facing slopes, which may be icy longer than the main route. The biggest advantage of the alternative route is that it adds some variety to the return part of the trip. 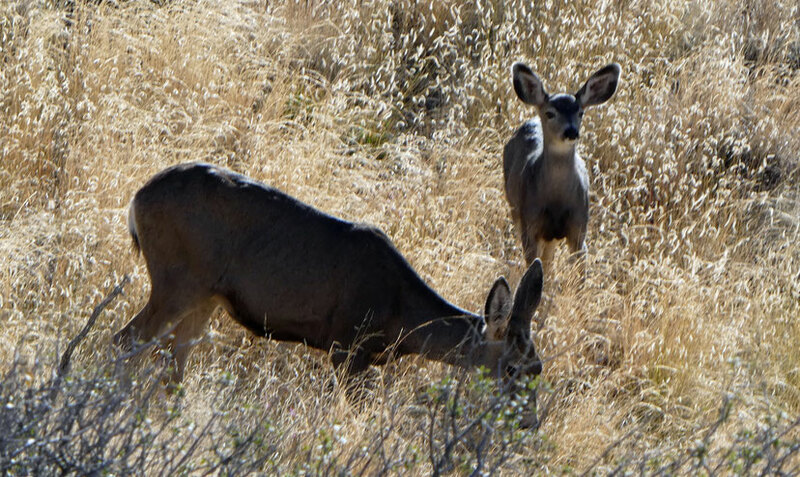 Mule deer and grama grass. Photo taken during a return trip in October 2018.